The political and economic ideas of socialism are coming back into fashion. Socialism saw its heyday in the 20th century when its ideas were adapted by a number of countries, in a variety of bastardizations of its message. In fact, some would argue that a pure socialism never existed. Now it is experiencing a tremendous resurgence in the 21st century due to the growing economic disparity, anger at the establishment and charismatic older socialist politicians like Bernie Sanders in the U.S. and Jeremy Corbyn in the U.K. who gathered massive support from the young. A new wave of socialist thinkers is also beginning to emerge that looks to distance the movement from the historical stigma to formulate a new socialism that speaks to the challenges of today. What is socialism? In the most basic definition, it is a political and economic system where the means of production and essential resources are owned by the community. Socialism comes in many different forms and has been practiced with great variety around the world. Private property would not exist, but personal property would remain. The government will not take away your “Kenny Loggins records,” jokes Sunkara. In their guide, the writers and editors of Jacobin also try to dispel some of the confusion related to socialism. In particular, they argue, many people tend to associate any kind of government institution, even the DMV, with socialism. But just because it’s a part of the government doesn’t make it socialist. In fact, an average person has so little say politically due to the stronghold of corporate interests on the government, that any “state action will disproportionately benefit capitalist interests at the expense of everything else,” writes Chris Maisano in the Jacobin’s guide. The journal also offers a defense against the charge that socialism inevitably ends up in authoritarian governments. Joseph M. Schwartz writes how Marxists and European socialists could not anticipate that revolutionary parties would try to create socialism in “predominantly agrarian, autocratic societies” like Russia and China. “In many ways, one-party Communist states shared more in common with past authoritarian capitalist “developmentalist” states — such as late nineteenth-century Prussia and Japan, and postwar South Korea and Taiwan —than with the vision of democratic socialism. These governments prioritized state-led industrialization over democratic rights, particularly those of an independent labor movement,” writes Schwartz. Jacobin’s prescription for building a more socialist country - mobilize the people through education and direct participation in the government. Is Bernie Sanders a socialist? He is the country's most popular active politician according to the polls, but he's not socialist enough, according to the editors of the Jacobin. Noam Chomsky famously called him “a decent, honest New Dealer.” Sanders himself draws the distinction, calling his politics - democratic socialism. He often refers to Scandinavian countries as models for what he would like the United States to become. Sanders’s key themes of reducing economic inequality and the influence of politics in money appeals to a cross-section Americans from the left and the right. To combat the negative stereotypes of socialism, Sanders invokes the New Deal policies of Franklin Delano Roosevelt that were called “socialist” like establishing social security and the minimum wage. Sanders also links the way he sees the world to Martin Luther King’s calls for social and economic justice. He defined “democratic socialism” himself in 2015 as a necessary adjustment in an increasingly unequal society. Is Jeremy Corbyn a socialist? The leader of UK’s Labour Party, which won a surprising number of seats against the ruling Conservative Party in recent elections, also identifies as a “democratic socialist.” Labour’s 2017 manifesto, titled “For the Many, Not the Few” includes plans to re-nationalize the rail, postal and water services, abolish college tuition fees, increase the minimum wage and spending on national healthcare, as well as upping the tax on the wealthy. Many of these ideas are certainly more to the left of what's been proposed by Sanders for the U.S.
Corbyn’s message has energized young voters in particular, with close to 70% of those 18 to 24 supporting Labour. How much more support can these kinds of ideas gain? The latest polls show the party’s appeal growing wider still, now 5% ahead of the Tories at 46%. Corbyn’s personal approval is also high, better than the Prime Minister Theresa May’s. To consider why the ideas of socialism continue to have followers in our times, let’s turn to Albert Einstein. One of the world’s most brilliant thinkers who had seen the effects of socialism in his lifetime, Einstein wrote an essay called “Why socialism” in 1949 that still resonates in some of its themes. Einstein critiques capitalism as having a tendency towards becoming an oligarchy where “private capital tends to become concentrated in few hands” that cannot be “effectively checked even by a democratically organized political society”. This happens because the capitalists control the main mass media sources (including education) while the members of the government come from political parties that are “largely financed or otherwise influenced by private capitalists who, for all practical purposes, separate the electorate from the legislature.” As as a result of that, according to Einstein, these representatives do not “sufficiently protect” the interests of the underprivileged. Sounds familiar? If similar challenges present themselves almost 70 years later, it is no surprise solutions like socialism come back. Of course, there are now also fears of fascism returning to fashion. Einstein saw the establishment of a “socialist economy” with an accompanying educational system that’s oriented towards social goals as the only way forward for society. “In such an economy, the means of production are owned by society itself and are utilized in a planned fashion. A planned economy, which adjusts production to the needs of the community, would distribute the work to be done among all those able to work and would guarantee a livelihood to every man, woman, and child. The education of the individual, in addition to promoting his own innate abilities, would attempt to develop in him a sense of responsibility for his fellow men in place of the glorification of power and success in our present society,” wrote Einstein. Einstein did caution, however, perhaps with an eye towards the Soviet Union, that a planned economy might result in “the complete enslavement of the individual” by the bureaucracy and saw it essential for socialism to resolve the problem of protecting the rights of the individual. Historical lessons aside, socialism is a rejuvenated force. Polls show that somewhere between 30 to 60% of Democratic voters have a favorable view of its ideas. Over 50% of millennials have a positive opinion of socialism. 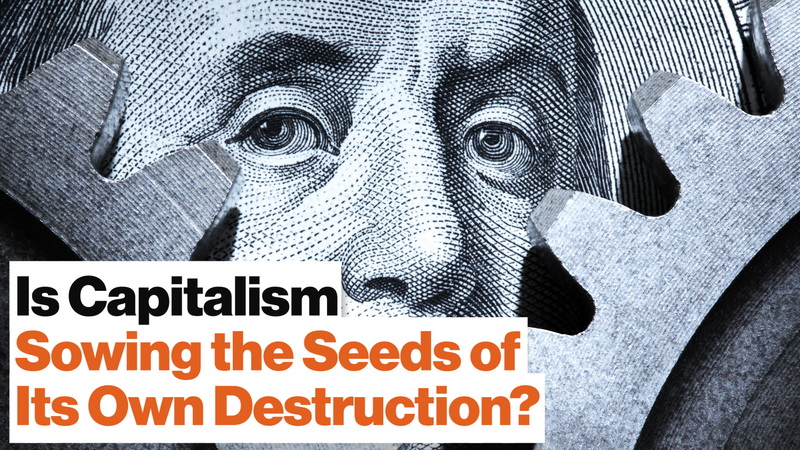 As automation is sure to put a major portion of the world out of work, the issues around ownership of necessary resources and distribution of wealth are sure to stay vital.